Appreciating Famous Games is written by Ohira Shuzo 9-Dan and published by Ishi Press. Out of print as of 2009 . It is published in the perfect pocket format and not too difficult to read whilst out and about -- the diagrams show at most 20 moves, and there are plenty of reference diagrams to illustrate a detailed analysis of the game. Bob McGuigan: I love this book. The commentary is very informative and inspiring. The actual game records might be available on GoBase but not the commentary, it's copyrighted. Zengarden Unfortunately this excellent book is now out of print. One can only hope that Kiseido Digital will bring it back into circulation! I feel extremely fortunate to have found a copy while on a visit to Tokyo some time ago. The book was something of a pioneering effort back in 1977 when it was published. Happily this type of book has become more common in English since then,but it is one of the best of its kind. 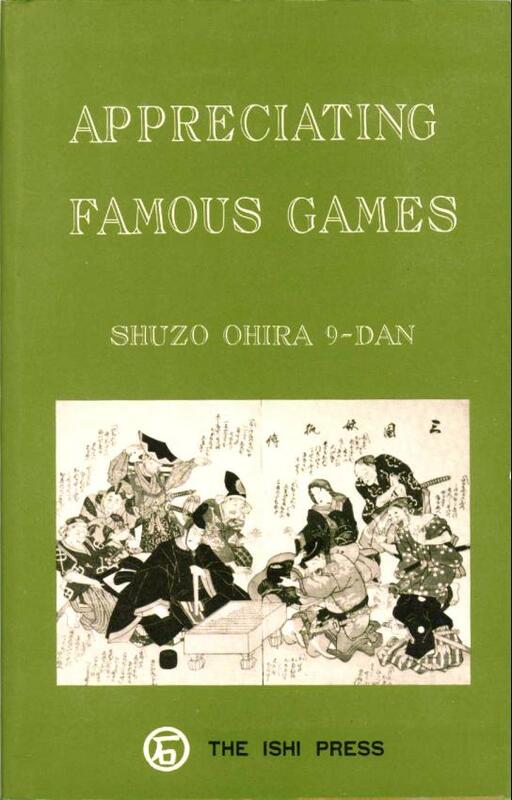 Of particular interest is the historical background which Ohira Shuzo gives in his introduction to the games. The games themselves are all of a very high standard, as one would expect, The analysis is deep and instructive, and the style lively and engaging. It had been on my mind for several years to choose some old games of Go and to comment on them from the modern point of view, so that players from the 9 to 4-kyu in particular could understand them. The opportunity to do this came quite unexpectedly when I was asked to write a Go Super Book. This is not really a collection of "famous" games. The epithet is too subjective anyway. Criteria such as no bad moves, an abundance of good moves, thrilling climaxes and so on could be established, but even so views would differ. I have in fact chosen 10 games from before the Meiji era (1868 onwards), although there is no special significance in this date. Of these, the second game, between Honinbo Dochi and Satonoshi, is far from being a classic. Satonoshi was a very weak player and made many bad or dubious moves. However, it is included here because of the skilfulness with which Dochi despatched his opponent. This is one of the two handicap games requested by the editors. No doubt a better game between Honinbo Genjo and Chitoku than the one given here (game 4) could have been found, and a similar question mark hangs over the game between Honinbo Shusaku and Yuzo (game 9). However, these games have been included because they have their own intrinsic interest. There were many games I wanted to include apart from these 10. The duels between Genjo and Jowa, Jowa and Genan, and Shuwa and Sanchi are full of fascination, and the famous "red ear" (See Ear Reddening Game) game between Genan and Shusaku, or Intetsu's game against Jowa in which vomited blood (See the Blood Vomiting Game) because of his efforts to win, are equally worthy of inclusion. There are many ways of studying Go. Fuseki, tesuji and life and death can all be learnt from books, but studying games is the most direct method of improving your all-round strength. Fuseki and so on are all included in the one game in living form. Studying various aspects of Go in isolation may not up your strength at all, but a game with a comprehensive explanation brings these aspects to life and makes them easier to learn. It makes no difference whether the games are old or new, or even amateur or professional. This is how I would like you to study this book -- with a comprehensive attitude. You can treat it as like reading for a train journey because there are only a few moves the diagram. If you have the time, however, you should go over the games thoroughly on a board. Are (some of) the sgfs available for download somewhere? also a few of the "bonus" games too.